One Way Electric, the Right Way! 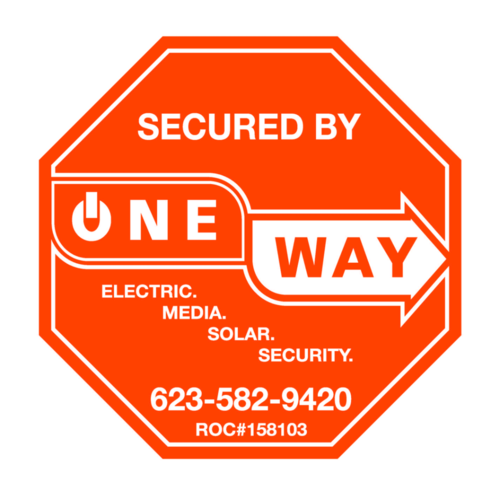 One Way Electric is an electric contractor in Phoenix, AZ that specializes in the design and installation of electric, media, security, and solar power systems. Unlike other electrical contractors, we have a multi-angle approach which involves taking on the electrical portions of the project, as well as the low-voltage and solar aspects. Make sure you’re wired for the future by hiring us to take care of your electrical needs. Rely on us for all of your backup energy needs. Enjoy first-rate media systems with customized electronic integration and simple designs. Add value to your home, and make it energy efficient by installing solar power systems. Additionally, we perform lighting control and home automation installations. Since 1995, One Way Electric has been designing and installing only the best lighting, electrical, solar, and audiovisual systems for both residential and commercial clients. Since we have more than two decades of experience under our belt, you can be confident that our team will do the job efficiently. We are affiliated with Lutron and Generac, as well as an authorized Crestron dealer. We are certified by these companies, and we make sure to take their training sessions yearly, so you can be sure that we are up-to-date with any innovations. We are licensed under ROC 158103 and Alarm 18188-0. At One Way Electric, it is our mission to provide quality electrical craftsmanship that will thoroughly satisfy our clients. We accomplish this through applying our knowledge and our more than 20 years of industry experience. In addition, we build strong relationships with architects, builders, lighting designers, and interior designers so we can serve you better. “On behalf of the job site team and staff of Kitchell Custom Homes, I would like to commend your firm on the outstanding performance demonstrated at the H&S International/Esposto Residence in Scottsdale, AZ. Your ability to manage the scope of work and your commitment to quality has made a significant contribution to the success of the project. We appreciate the opportunity to work with a company who makes a conscientious effort to ensure quality workmanship and exhibit safe job site practices at all times. The project team indicated that your performance was above and beyond the requirements. We look forward to working with One Way Electric on future projects and appreciate the working relationship we have developed over the years." “We have a number of jobs in process with One Way Electric. So far, you have provided us with quotes and performed your work to date as agreed. We wish to express our thanks for the professional way you have approached the job and the remarkable patience and courtesy you have extended. In the course of our very extensive renovations in our home over the past year, we have used a number of contractors for various assignments. One Way Electric ranks on top in terms of skilled and talented employees, timely attendance, and quality of work product.